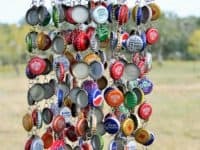 We’ve seen the many wonderful things countless DIY enthusiasts have transformed their empty glass (and even plastic) pop bottles into, but this time it was actually the bottle caps that had us interested! That’s how we found ourselves sitting down with our drink to browse the Internet for crafty inspiration and then beginning what would become a sizeable bottle collection that very night. 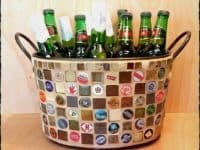 Just in case you’re as enamoured with the idea of making fantastic DIY projects using bottle caps as we were, if not more, here are 15 of the most interesting designs, ideas, and tutorials that we came across in our search! 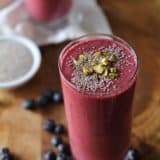 We know we just talked a lot about pop and soda bottle caps, but those aren’t the only drinks that feature the kinds of caps you need for these projects! We’ll admit that a large portion of the bottle cap collection we amassed for crafting purposes came from the beer drinkers in our house. 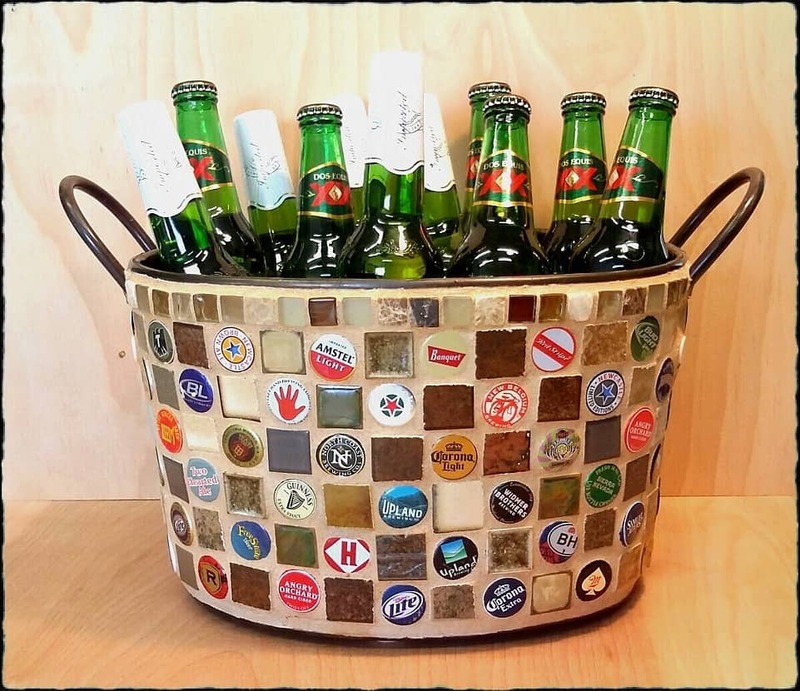 That’s actually how we fell in love with this idea for making a homemade beer bucket that’s covered in a collection of differently designed and branded bottle caps for the very beer lovers we just mentioned! 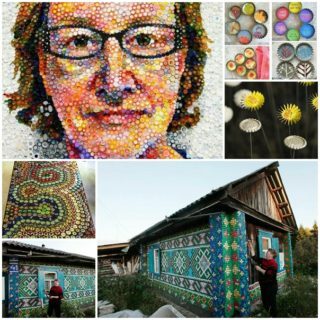 See how it’s done in surprisingly few steps on Mosaic Garden. 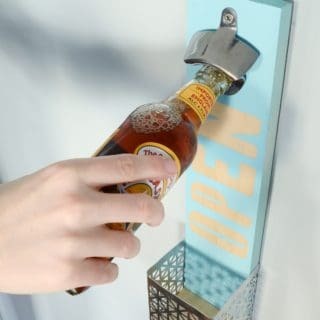 If you’re going to get crafty with something as explicitly upcycled as bottle caps, would you rather go all out when it comes to embracing the clearly homemade and unconventional aesthetic and repurpose something else along with it? 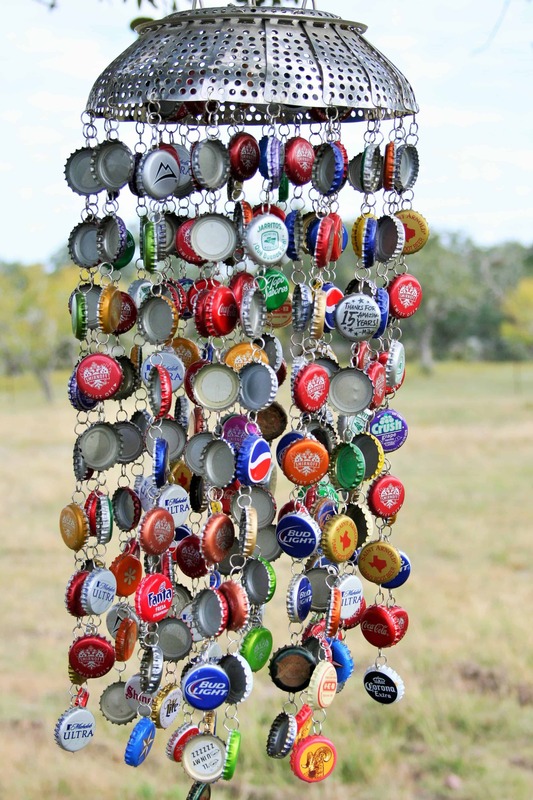 In that case, we think perhaps this hilariously homemade looking wind chime made from bottle caps and an old metal sieve might be right up your alley! 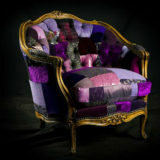 See how it’s made in more detail on Craft Zone Six. 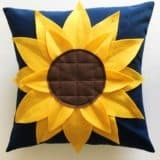 Have you always been the kind of crafter who loves simply arranging and organizing bits and pieces until you’ve made some kind of image, regardless of what you’re working with? 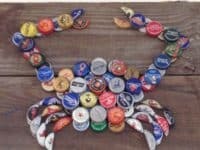 Then we have a strong feeling you’ll get along very well indeed with this awesome bottle cap crab art outlined step by step by Unders Case and mounted on a wooden backing! 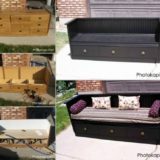 We love how this project feels like you’re turning trash into treasure. 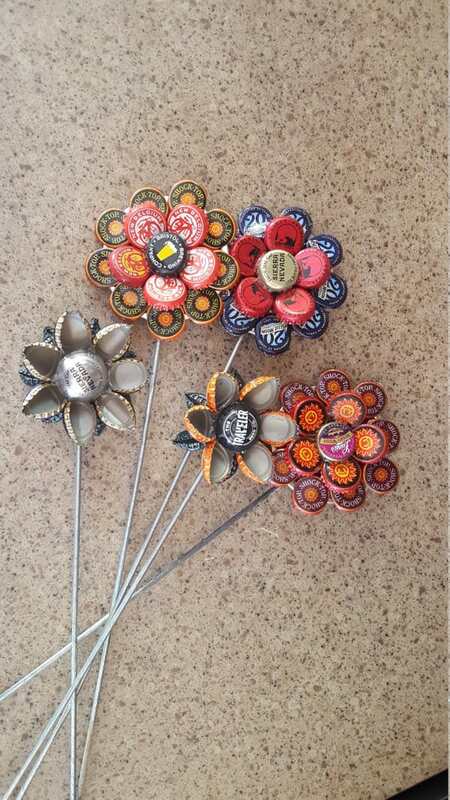 If you’re going to put the effort into making a project from scratch out of something as small as bottle caps that you’ve actually had to collect, would you rather go all in and really make something that will be a statement or conversation piece when people see it in your home? 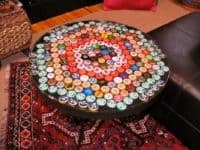 Then we think perhaps you’ll get along very well indeed with this tutorial from Instructables that teaches you how to make a bottle cap surfaced tabletop that’s perfect for a games room! 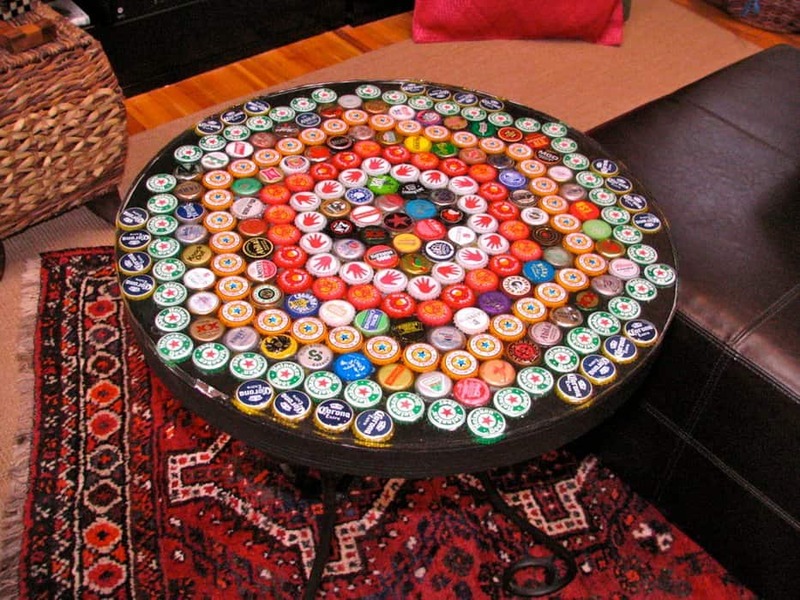 We think it’s very smart how they fill the spaces between the caps with resin so that your drinks will sit flat when you place them on the table, rather than tipping between the cracks. 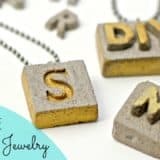 Are you actually quite enamoured with the idea of making crafts with bottle caps because you’ve always been interested in really hands-on DIY methods that involve using tools and doing metalworks? 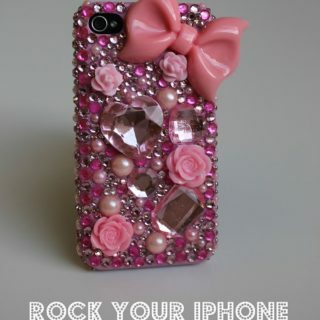 In that case, maybe doing a bit of upcycled sculpturing would be the best idea for you! 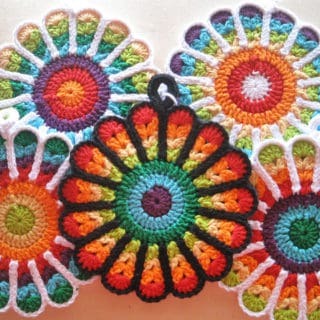 We love the way Crafts Post created shockingly pretty flowers using colour coordinated bottle caps that have been layered and bent. 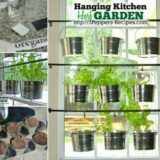 Are you actually a huge fan of the idea of making more industrial or clearly upcycled looking things like bottle caps into projects that make them look much softer or homey? 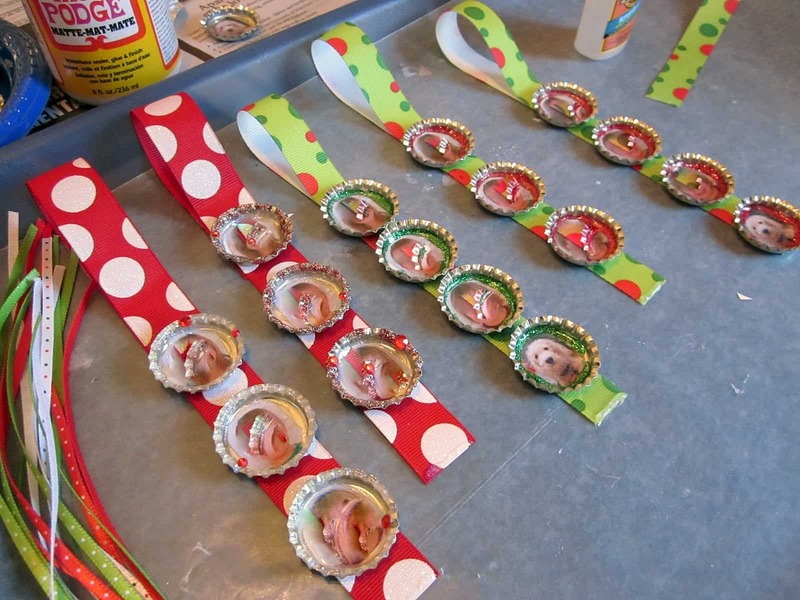 In that case, we think you might just be the perfect person to try your hand at making these adorable bottle cap and ribbon photo ornaments outlined step by step on Teach Mama! They show you how to paste the photos in so they stay well. 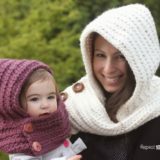 We liked that you could make yours as long as you please! Did we really catch your attention when we started talking about awesome things you could make for your kids using bottle caps, but your little ones are much quieter and would be more likely to play with a toy or figurine that will simply let them privately pretend in an imaginary game on a calm afternoon? 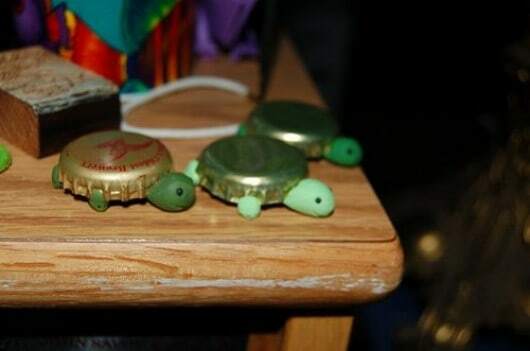 Then maybe something like these adorable little bottle cap turtles would be a better choice for them! 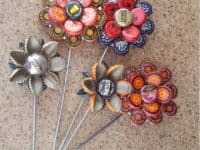 Check out how Beer Bottle Cap Crafts made them using bottle caps, air drying clay, and some paint. 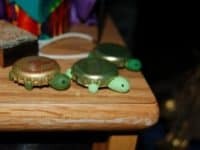 This project is easy enough that your kids can probably even help you make the turtles themselves. 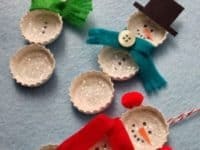 Are you actually still thinking about the bottle cap ornament idea we showed you earlier on our list because, despite the fact that it’s still summer, because you’re the kind of super organized crafter that collects seasonal and holiday DIY ideas and holds onto them until you need them? 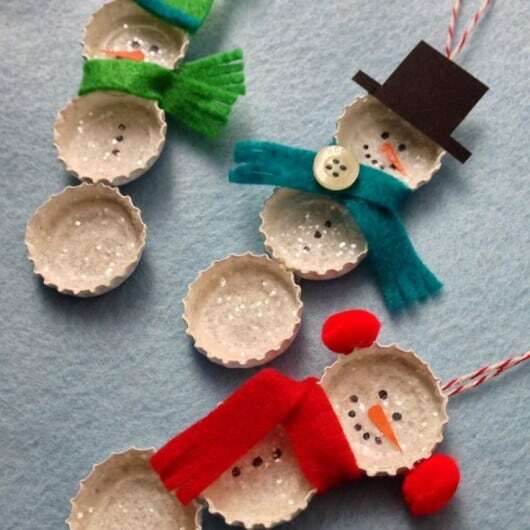 Then we’d suggest bookmarking this page from Crafty Lumberjacks that teaches you how to make adorable sparkling bottle cap snowmen! 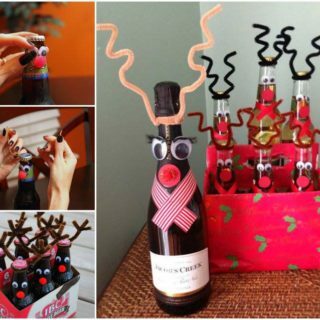 After all, you can never have enough DIY Christmas ornaments, right? 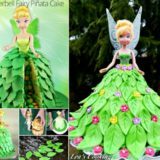 Perhaps you’re a little more experiences in your crafting because you’ve been a DIY enthusiast for many years now, so you’d rather tackle something very impressive like a sculpture made of unconventional materials? 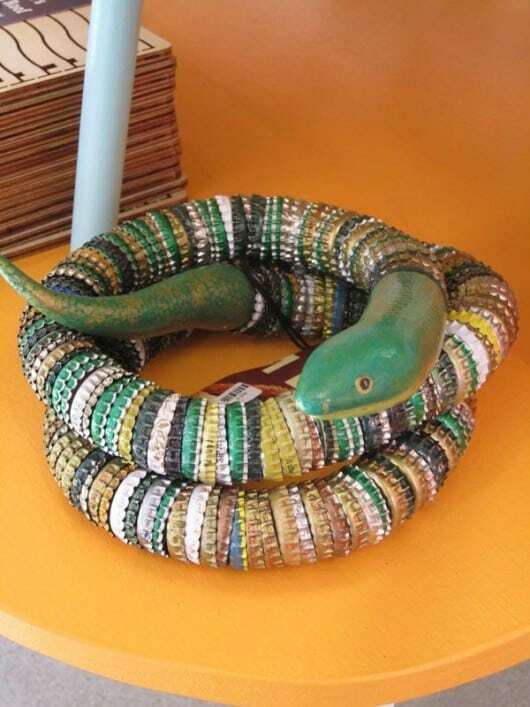 In that case, we’d definitely encourage you to take a look at how In Downcity punched holes in the middle of many bottle caps and threaded them together until they formed a formidable metal snake that you can position in different coiled poses. 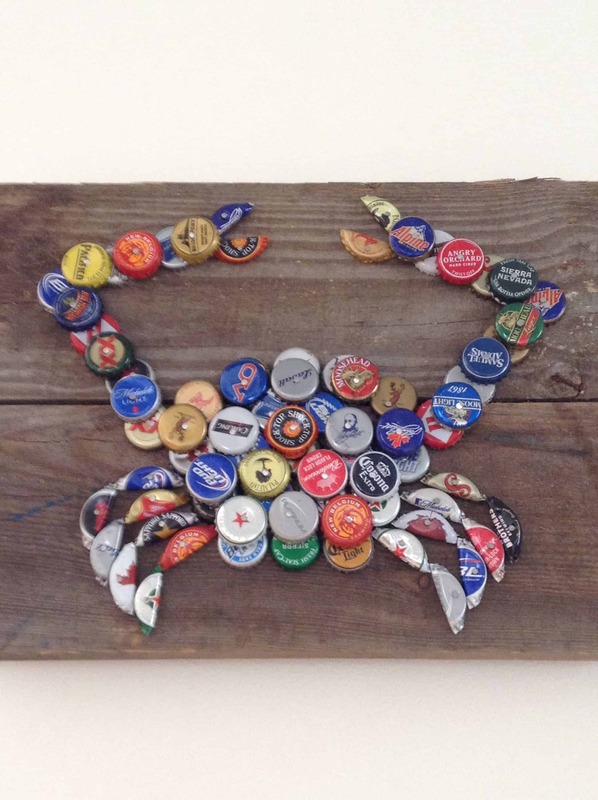 Were you really intrigued by the idea we showed you earlier of making a wood mounted crab out of bottle caps but now you’re rethinking whether a red toned crab will actually be the best choice for your indoor decor aesthetic and colour scheme, even if you’re sure you’d like a sea life piece? 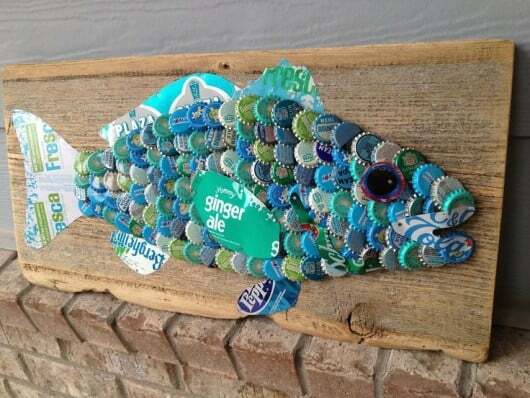 Then maybe you’d prefer to make this wood mounted bottle cap catfish art instead! See how it’s done in more detail on The Moore Family Folk Art. Of course, you can use whatever colour bottle caps you please, but we love the way they kept their labels and brand markings in the blue and green shade ranges. 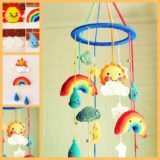 As avid crafters, we’ll fully admit that we go through phases when it comes to the kinds of crafts we’ll do, as we’re sure you can already tell from the way we’ve been binge searching bottle cap crafts here and now. 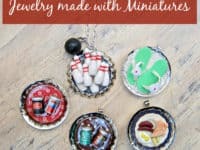 Previously to our admiration for bottle caps, however, we were actually kind of obsessed with accessories that featured miniatures! 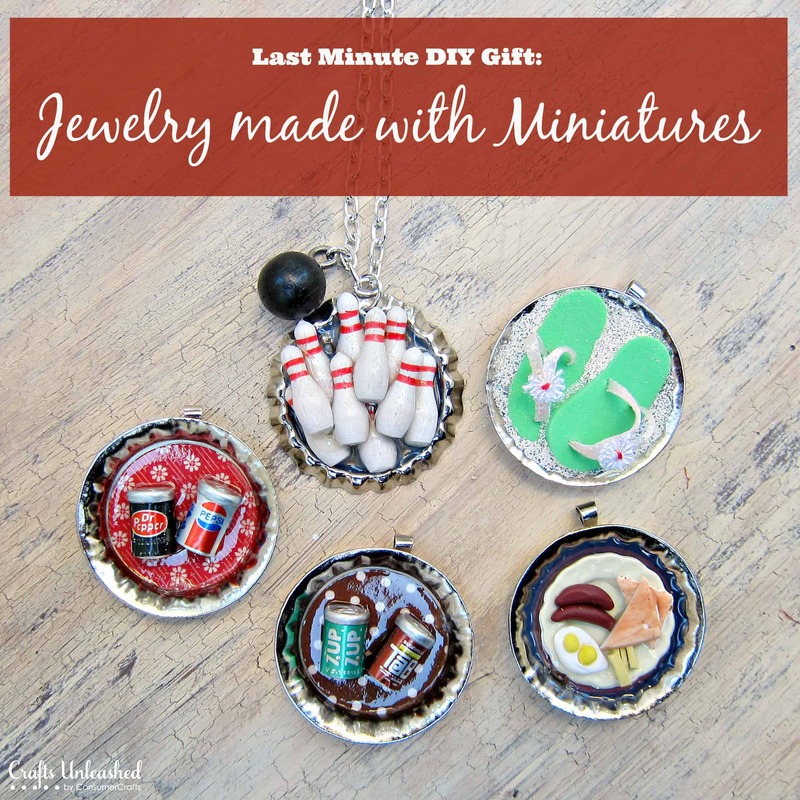 Imagine our excitement, then, when we discovered this tutorial from Crafts Unleashed that combined the two ideas by showing you how to create necklace pendants featuring miniature clay foods, as though the cap is a tray.